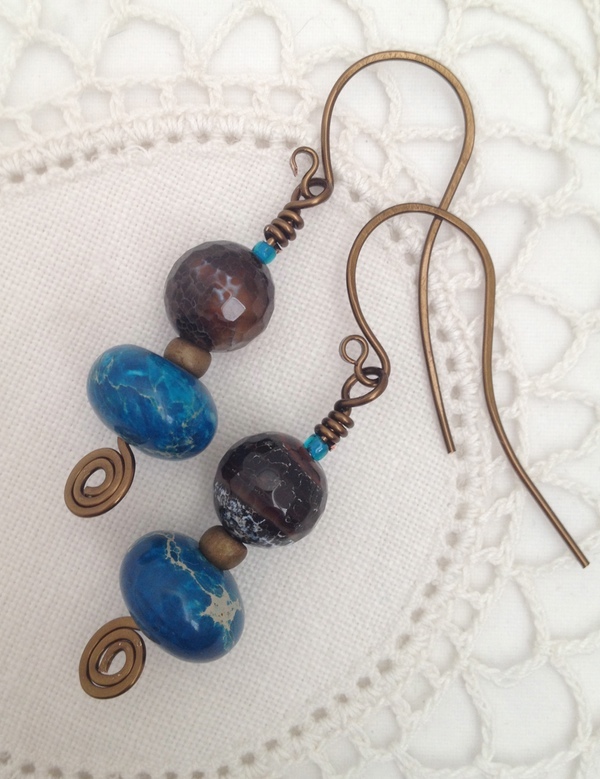 This year's Bead Soup took a number of twists and turns before I finally hit on the right track. I thought I was going for polished at first. But the wonderful lines and striations in the stone Judy had sent called out for something more organic and freeform. And who am I to resist that call? I have no willpower where that's concerned. So here's Wrack and Ruin, so named because I kept telling myself stories of buried pirate treasure as I worked. 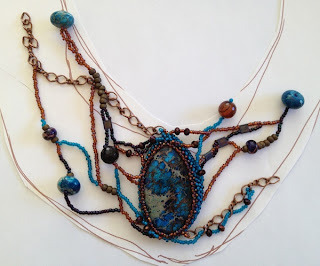 The bead strands reminded me of kelp or seaweed, of tarnished bronze and deep sea water. So even though I hadn't intended a sea piece, that's how it turned out. I should just admit by now that all of my Bead Soup projects somehow relate back to the sea. The briny soup from whence their inspiration came. I don't normally use props in my photography, but the driftwood was just to perfect not to use it for a photo! Oh, and Judy checked on the stone for me. Turns out it's dyed Jasper. I should have known - I seem to have a love affair with Jasper, even when I don't know it! Be sure to check out what Judy Riley of Three Red Beads made with the beads I sent her, and all the other fantastic Bead Soup creations. And thanks again to Lori, our wonderful hostess, head chef and bead wrangler! Looked rather like a demented octopus at this stage! 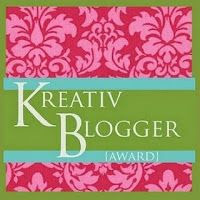 Karen Williams, Baublicious - You're here! lol @ demented octopus. It did turn out just fine in the end :) Love the beaded bead! Kashmira - I tell myself funny stories while I work, and about the stage of that photo, the story went along these lines. Once there was an octopus who desperately needed a new hidey hole. It was shark migration season and his old spot was simply too exposed. So he scooted on over to the sunken ship in the neighborhood to check it out. Most of the best spots were already taken, but the octopus, being curious by nature, kept exploring. He came across this object with smooth, shiny sides. It narrowed towards one end and the texture changed. Curious, he played one tentacle around that end and discovered someone had stuffed something into it. With a good tug, it came free! Whatever the plug had been, it wasn't good to eat. But looking at the now open cavity, he realized he'd found his new hidey hole. The opening was pretty small, but he could squeeze through. Something no shark could possibly do! So in he went. Unfortunately for the octopus, his new lair wasn't quite as empty as he thought. Even mixed with the sea water, the rum from the half full bottle was still quite potent. Several hours later, when the octopus got hungry, he discovered none of his tentacles wanted to do quite what he said. They went every which way, splaying out around him and he couldn't get anywhere. Three even got so tangled that he couldn't pull them apart. The only good news was, for the first time in his life, he had no fear whatsoever of sharks. He didn't think about sharks, not once, during the seemingly endless time it took, hanging there, to untangle his tentacles. But by the time he did, a small school of fish had wandered into the wreck. So he had a great dinner and climbed back into his bottle. OMG, that is hilarious... lucky octopus, indeed, Karen! Perspective and attitude are so important in life (and a little rum never hurt)... If these projects are the result of talking to yourself, I hope you will continue to do so. Scary? Naw, just scary beautiful! Karen I love the necklace, earrings and extra credit! 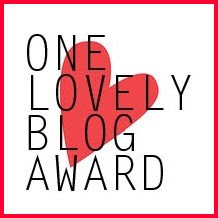 :) You do such wonderful work! Thanks Judy! You sent such wonderful beads and baubles for me to work with! Such a talented bead-er...gorgeous pieces! Great octopus story too! 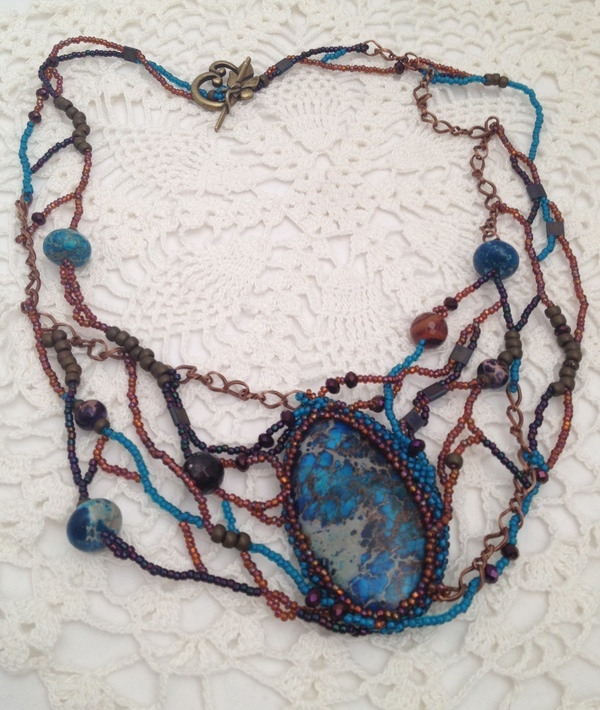 What a spectactular necklace, Karen -- I love your creation and the different colors you worked with. All the soup offerings are fantastic, and a tribute to your incredible talent! Oh wow that is amazing! So inventive and organic and beautiful! I love your finished piece. And the rummy octopus story too ofcourse!! Congratutaltion ! They are wonderful ! Extra credit made me smile, just because of the name. Your soup turned out well. I bet it lays beautifully. Lovely bead work...such lovely creations!! Nice job! I just love it when the beads speak. Great job! Simply stunning! You did an amazing job!!! 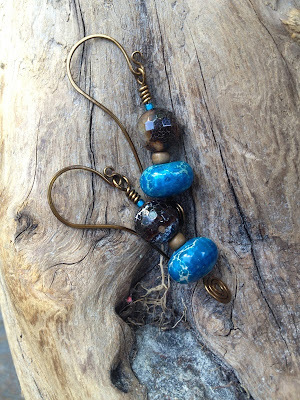 I love the earrings and beaded bead pendant. Great job with your soup ingredients! 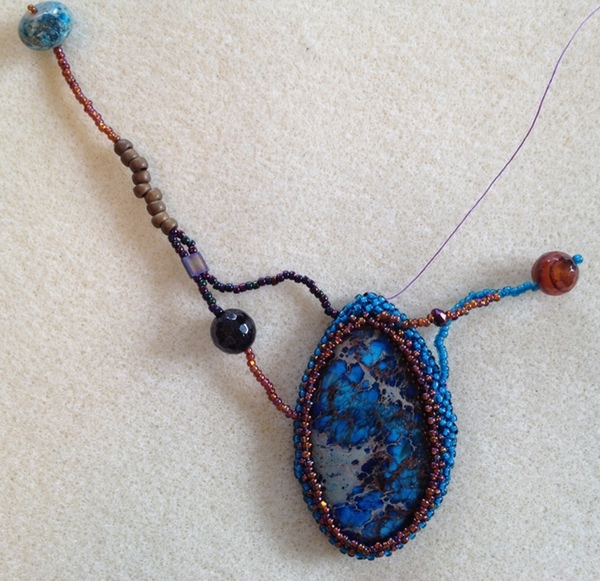 I'm impressed with your use of seed beads, they are such a challenge for me. The focal is an amazing color and I love that you thought of the sea, very creative. 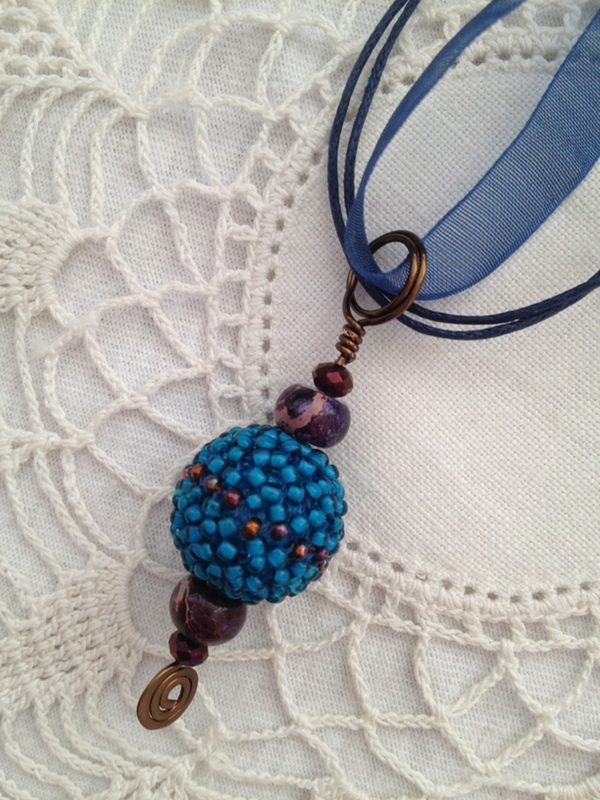 The seed bead pendant is fabulous; I think it's my favorite. Cheers! Freeform is my favorite - no rules! Stunning necklace - congrats! Gorgeous Necklace! The colors are amazing. I love the necklace!! it's so airy!! You did a great job!!! free-form beadwork really amazing! cogratulations! I always think of you and freeform together -- you do it so well! Having a story behind your piece is so cool. I rarely have that! And I admire the work that goes into a piece like this! Bead weavers always amaze me. You are no different. Great soup by a great artist. Wow, that is a lot of beadwork. But it turned out very nice. I have a love affair with Jasper, too. And my partner sent me a fabulous jasper focal for my soup. 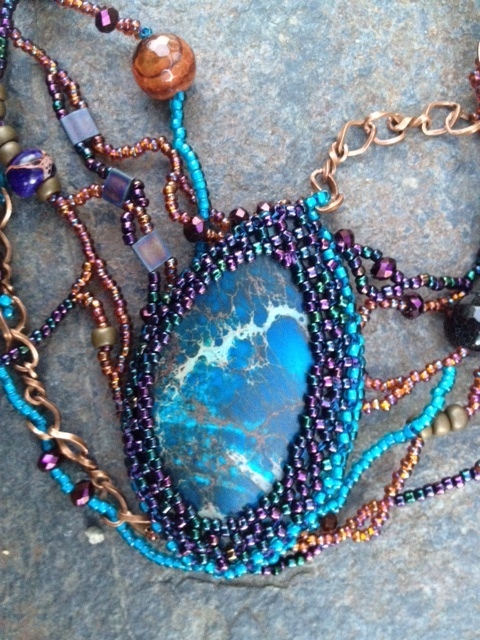 I always love seeing your beautiful freeform bead work. It is truly inspired. Great job! Great job. Lovely beadwork. 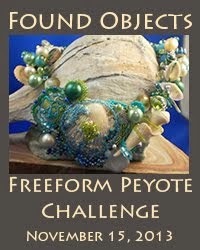 I love freeform beading! Beautiful designs,and colour I love the necklace!!! Beautiful designs and colors, awesome bead work and love seeing the work in progress photos. I love the blue and brown together. The bead work is amazing. 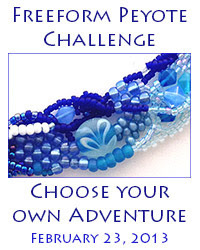 I absolutely love your designs, I too tell myself stories as I bead (if only I could put those to paper) and your story of the sea is so perfect for you necklace. It truly does look like all elements of the briny deep. Gorgeous work. What an original necklace, I love it very much! I don't know if it's the driftwood or the actual design, but I totally get that seaside feeling from your piece too. It's lovely. The earrings and beaded bead pendant you also made are really wonderful as well! My jaw dropped at the first piece! I love the color, movement, and texture in this beadwoven necklace! Of course the other pieces are great too, but I keep going back up to the first one. Love the name you chose too! When I first saw the first piece, I thought this was perfect for Syrena, the timid mermaid in Pirates of the Caribbean installment. 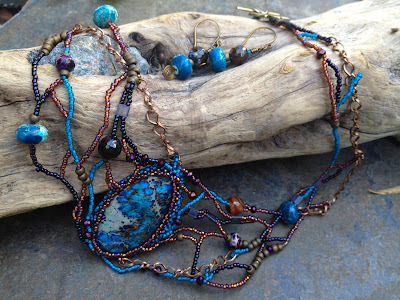 These are all lovely pieces that certainly remind us of the underwater. That necklace just exudes magical aura that's perfect for a getup with character. you necklace is really well named, a beautiful creation and very innovativ!! Amazing free form necklace and love your beaded bead necklace - great designs!! Wow looks hard to make - love the ensemble! 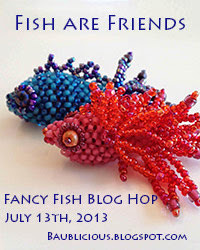 I love your briny design! The many strands of seed beads remind me of the seaweed strewn tide lines. I love the earrings too! Nice! Thanks for showing your process! Love that last beaded bead too! Beautiful! The delicacy of the freeform gives perfect focus to the great jasper focal - doesn't overwhelm, just highlights and enhances. 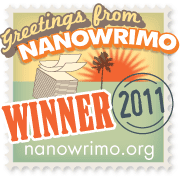 (And the demented octopus comment made me snort laugh...not terribly ladylike of me...) It's taking me forever to work my way through this hop, but your pieces were worth the journey! I love your necklace and its name suits perfectly. And I love the story of the demented octopus, can just imagine what got you thinking along those lines! Cute earrings too!